The Cathedral of Our Lady of Chartres, (French: Cathédrale Notre-Dame de Chartres), located in Chartres, about 50 miles from Paris, is considered one of the world's finest examples of the Gothic style of architecture. Begun in the twelfth century, the cathedral established several new architectural features and pioneered new techniques for construction at high elevations above ground. Long a site of holy pilgrimage due to its housing of a garment believed to belong to the Virgin Mary, Chartres Cathedral became both a source of great pride for the town's residents and a burden to some. During its early construction many townsfolk sacrificed willing to help in building it. The cathedral was burned down once, nearly consumed by fire a second time, and formed the focal point of several tax revolts and riots. It was the center of Chartres' economy and the focal point of almost every activity. The cathedral is still the seat of the Diocese of Chartres, in the Roman Catholic ecclesiastical province of Tours. In 1979, UNESCO designated the Chartres Cathedral as a World Heritage Site. 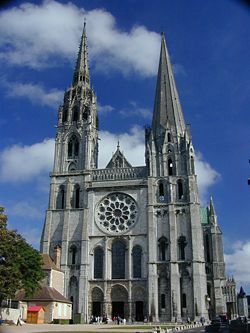 Its Heritage description reads: "Chartres Cathedral marks the high point of French Gothic art. The vast nave, the porches adorned with fine sculptures from the middle of the twelfth century, and the magnificent twelfth- and thirteenth-century stained-glass windows, all in remarkable condition, combine to make it a masterpiece." North transept of the central porch at Chartres Cathedral. According to legend, since 876 the Cathedral's site has housed a tunic that has been said to have belonged to the Blessed Virgin Mary, the Sancta Camisia. The relic had supposedly been given to the Cathedral by Charlemagne who received it as a gift during a crusade in Jerusalem. Historians believe the relic was actually a gift from Charles the Bald. The fabric is indeed very old and seems to have originated in an area consistent with the story of its having belonged to Mary, having been woven in Syria during the first century C.E. For hundreds of years, Chartres has been a very important Marian pilgrimage center and today the faithful still come from the world over to honor the relic. As a consequence, several cathedrals have occupied the site. All of the earlier buildings, being of wooden construction, were destroyed by periodic uncontrolled fires which swept through the town. The church was an especially popular pilgrimage destination beginning in the twelfth century. There were four great fairs which coincided with the main feast days of the Virgin: the Purification; the Annunciation; the Assumption; and the Nativity. The fairs were held in the surrounding area of the cathedral and were attended not only by the local population but by large numbers of pilgrims who had come to the town for the feast days and to see the cloak of the Virgin. 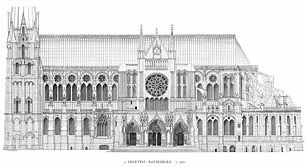 After an earlier wooden cathedral burnt down in 1020, the glorious new Romanesque basilica was built under the direction of Bishop Fulbert of Chartres. In 1134, the cathedral partly survived a fire which destroyed much of the rest of the town. Construction was renewed in 1145 amid great popular enthusiasm. Disaster struck yet again in the night from June 10 to 11, 1194, when lightning created a blaze that left only the west towers, the facade between them, and the crypt. The people of Chartres despaired when they believed that the Sancta Camisia had perished, too. Three days later, it was found unharmed in the treasury, along with the priests who had taken it there for safe keeping when the fire broke out, locking themselves in behind the iron trapdoors. The visiting papal legate, Cardinal Melior of Pisa, told the people that the survival of the relic was a sign from Mary herself and that another, even more magnificent cathedral should be built in Chartres. The rebuilding of Chartres Cathedral after 1194 took a relatively short 26 years, but at one point the townspeople revolted against the prospect of a heavier tax burden to finance the project. They stormed the bishop's residence and drove him into exile for four years. 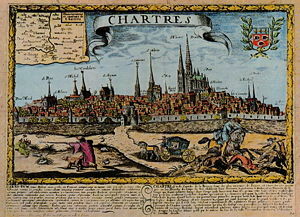 Engraving of Chartres in the 1600s. The body of the final cathedral—over a ground area of 117,058 square feet—was rebuilt between 1194 and 1220, a remarkably short span for medieval cathedrals. The rebuilding, with the help of donations from all over France, began almost immediately, using the plans laid out by the original architect, who remains anonymous. On October 24, 1260, the cathedral was finally dedicated in the presence of King Louis IX. However, the cathedral was never completed with the full set of spires that appear to have been planned for it in the early thirteenth century. The cathedral was damaged during the French Revolution when a mob began to destroy the sculpture on the north porch. The Revolutionary Committee decided to blow the building up and asked a local master mason (architect) to organize it. He saved the building by pointing out that the vast amount of rubble from the demolished building would so clog the streets it would take years to clear away. This is one of the few occasions during the Revolution when the anti-religious fervor was stopped by the town-folk. However, when metal was needed for the large army the brass plaque in the center of the labyrinth was removed and melted down. 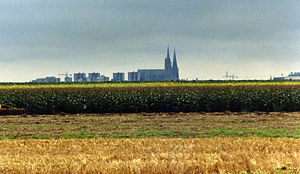 The town of Chartres seen from a distance. One of the many stained-glass windows at Chartres. Chartres is truly one of the greatest of all French Gothic cathedrals. From a distance it seems to hover in mid-air above waving fields of wheat, and it is only when the visitor draws closer that the city comes into view, clustering around the hill on which the cathedral stands. Its two contrasting spires—one, a 349-foot plain pyramid dating from the 1140s, and the other a 377-foot-tall flamboyant spire from the early sixteenth century—soar upward over the pale green roof, while all around the outside are complex flying buttresses. 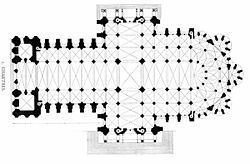 The plan is cruciform, with a 92-foot-long nave and short transepts to the south and north. The east end is rounded, with five semi-circular chapels radiating from it. The use of flying buttresses enabled the support of extremely high vaults, the highest in France at the time of construction. 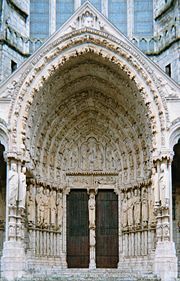 The cathedral used four ribbed vaults in a rectangular space, instead of six in a square pattern, as in earlier Gothic cathedrals such as at Lyon. The skeletal system of supports, from the compound piers all the way up to the springing, transverse and diagonal ribs, allowed large spaces of the cathedral to be free for stained-glass work, as well as a towering height. The spacious nave stands 118 feet high, and there is an unbroken view from the western end right along to the magnificent dome of the apse in the east. Clustered columns rise dramatically from plain bases to the high-pointed arches of the ceiling, directing the eye to the massive clerestory windows in the apse. Everywhere vivid color splashes on to the floor from the superb stained glass windows. 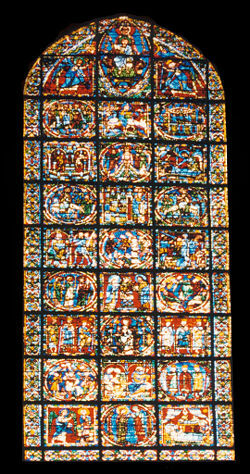 Dating from the early thirteenth century, the glass largely escaped harm during the religious wars of the sixteenth century; it is said to constitute one of the most complete collections of medieval stained-glass in the world, despite modernization in 1753, when some of it was removed. Of the original 186 stained-glass windows, 152 have survived. The windows are particularly renowned for their vivid blue color, especially in a representation of the Madonna and Child known as the Blue Virgin Window. 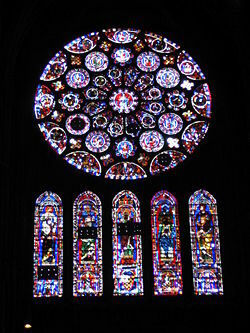 Several of the windows were donated by royalty, such as the rose window at the north transept, which was a gift from the French queen Blanche of Castile. The royal influence is shown in some of the long rectangular lancet windows which display the royal symbols of the yellow fleurs-de-lis on a blue background and also yellow castles on a red background. Windows were also donated from lords, locals, and tradespeople. The cathedral has three large rose windows: one on the west front with a theme of The Last Judgment; one on the north transept with a theme of the Glorification of the Virgin; and one on the south transept with a theme of the Glorification of Christ. On the doors and porches, medieval carvings of statues holding swords, crosses, books, and trade tools, parade around the portals, their expressions as clear today as when first carved 700 years ago. The sculptures on the west façade depict Christ's ascension into heaven, episodes from his life, saints, apostles, Christ in the lap of Mary, and other religious scenes. Below the religious figures are statues of kings and queens, which is the reason why this entrance is known as the 'royal' portal. While these figures are based on figures from the Old Testament, they were also regarded as images of current kings and queens when they were constructed. The symbolism of showing royalty displayed slightly lower than the religious sculptures, but still very close, implies the relationship between the kings and God. Sculptures of the Seven Liberal Arts appeared in the archivolt of the right bay of the Royal Portal, which represented the school at Chartres. During the second World War, most of the stained glass was removed from the cathedral and stored in the surrounding countryside, for protection from German bombers. At the close of the war, the windows were taken out of hiding and replaced. On the exterior of Chartres Cathedral, by the north door, there is a carving on a pillar which alludes to an object sought by the Knights Templar when, in 1118, they undertook excavations beneath the Temple of Jerusalem and supposedly made an important discovery. An ancient tradition maintains that the Ark of the Covenant had been secreted deep beneath Solomon's Temple centuries before the fall of the city to the Romans. Persistent legends recount that the ark was deposited for safekeeping in the crypt of Chartres, where it remained for centuries. The carving on the pillar is supposed to represent the Ark of the Covenant being transported on some type of wheeled vehicle, a cart or, possibly, a wheelbarrow. In the Middle Ages the cathedral also functioned as an important school. Many French cathedral schools had specialties, and Chartres was most renowned for the study of logic. The logic course taught in Chartres was regarded by many as being superior even to the one taught at the famous University of Paris. One person who was educated at Chartres was John of Salisbury, an English philosopher and writer, who had his classical training there. Chartres is built on the left bank of the Eure River, on a hill crowned by its famous cathedral, the spires of which are a landmark in the surrounding country. 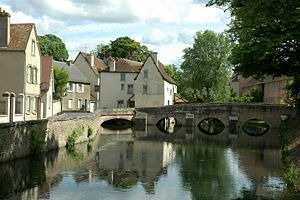 To the southeast stretches the fruitful plain of Beauce, the "granary of France," of which the town is the commercial center. The abbey church of St. Pierre, dating chiefly from the thirteenth century, contains, besides some fine stained glass, 12 representations of the apostles in enamel, executed in about 1547 by Léonard Limosin. 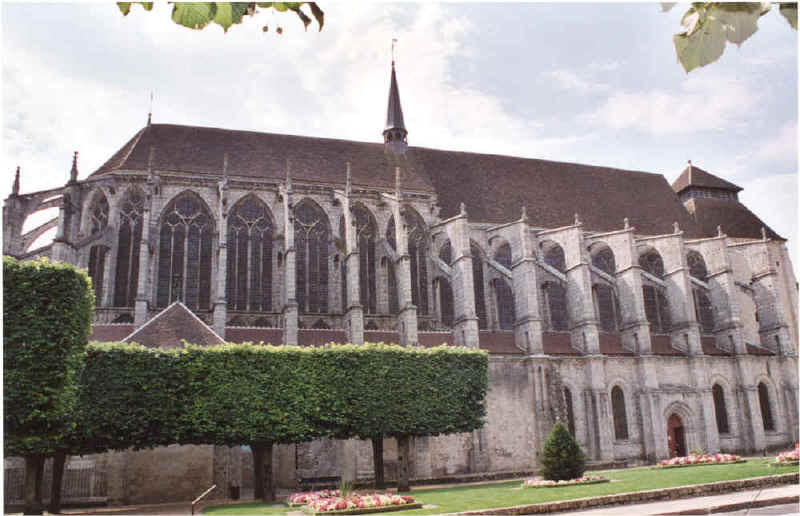 Other noteworthy churches in Chartres are St. Aignan (thirteenth, sixteenth, and seventeenth centuries) and St. Martin-au-Val (twelfth century, for which the surrounding city financed the stained-glass windows. The Eure River, which at this point divides into three branches, is crossed by several bridges, some of them ancient, and is fringed in places by the remains of the old fortifications, of which the Porte Guillaume (fourteenth century), a gateway flanked by towers, is the most complete specimen. The steep, narrow streets of the old town contrast with the wide, shady boulevards which encircle it and divide it from the suburbs. Chartres has been a site of Christian pilgrimage since the Middle Ages. The poet Charles Péguy (1873-1914) revived the pilgrimage route between Paris and Chartres before the First World War. After the war, some students carried on the pilgrimage in his memory. Since the 1980s, the association Notre-Dame de Chrétienté, with offices in Versailles, has organized the annual 62-mile pilgrimage on foot from the cathedral of Notre-Dame de Paris to the cathedral of Notre-Dame de Chartres. About 15,000 pilgrims, mostly young families from all over France, participate every year. ↑ Side view of St. Pierre www.wannabi.com. Retrieved February 5, 2008.